Our long national nightmare is over: Brett Favre is a New York Jet. The Brett Favre era in Green Bay officially came to an end late Wednesday night as the legendary longtime Packers quarterback was traded to the New York Jets, the Packers announced. The exact compensation wasn’t immediately available, but it is believed to be a fourth-round draft pick that increases in value depending on how the Jets perform in the 2008 season. According to the NFL Network, if Favre takes 50 percent of total snaps with the Jets in 2008, the fourth-rounder becomes a third-round pick. If he gets 70 percent of the snaps and the Jets make the playoffs, it becomes a second-round pick; and if he gets 80 percent of snaps and the Jets make the Super Bowl, it becomes a first-round pick. That strikes me as a fair deal.Â A high draft pick is a lot to pay for a player, even a future first ballot Hall of Fame quarterback, on his last legs.Â Then again, it only becomes a first day pick if the Jets, who were 4-12 last season, make it to the playoffs.Â Like ESPN’s John Clayton, I’m skeptical that Favre can do that much by himself. Favre alone isn’t going to cut the gap between the Jets and the New England Patriots. The Patriots have Tom Brady, Randy Moss, Bill Belichick, a great team and the easiest schedule in the league. 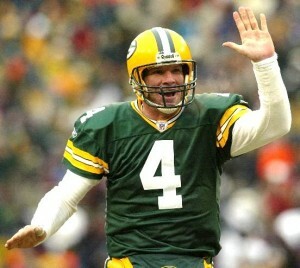 Favre has only the satisfaction that he’s out of Green Bay. And, no, the Jets can’t trade Favre to the Vikings. The NFL Network also is reporting that the Packers took great pains to ensure that Favre would not be traded to the Vikings by inserting a “poison pill” in the deal. If Favre were to be traded to Minnesota, New York would have to surrender three first-round picks to Green Bay. No player, let alone an old one, is worth three first rounders. Could Bush Fall to #5?